Let’s not put the cart before the horse. We all have used adages. Some are centuries old when it was really something special when a penny saved was a penny earned. For some adages, things are not always what they seem which makes appearances deceiving. To the few people in the room within my age group, they understood what I said. Those younger than being eligible for AARP and those born outside of the United States did not understand. Since it is more blessed to give rather than receive, it gave me the opportunity to teach someone about the origin of money in the United States. When the colonies were settled, George I was the King of England. Although the king ruled from an ocean away, the governors sent to manage the colonies on his behalf were under strict orders to not allow the colonists to coin money. An exception was made during a small period in the 17th century, colonists had to make due with the low-value copper coinage the king and his governors allowed. Even with a standing army in the colonies, the governors could not control the commerce. Instead, they applied duties and fees for allowing the colonists to trade with the rest of the Western Hemisphere. Notice that there were no taxes because only the king could tax the royal subjects. Governors could levy duties to run the colonies. They also took kickbacks and bribes in order to get their way. Although the Pound Sterling was the coin of the realm it was not available to the colonies. Instead, trading posts accepted the 8 reales coin, also known as the Thaler or Spanish Milled Dollar, as payment for goods and services. With the trade of high-cost goods like tobacco, cotton, and hides caught in the Appalachian Mountains the colonies relied more on the Spanish Milled Dollar than on the copper British coins. Colonial governors ignored the growing economy, as they were able to satisfy the companies that sponsored the settlements and paid the taxes while lining their pockets. Colonists were able to make do with what was left. A problem came about that everything could not be worth 8 reales and without subsidiary coinage, it was impossible to give change. 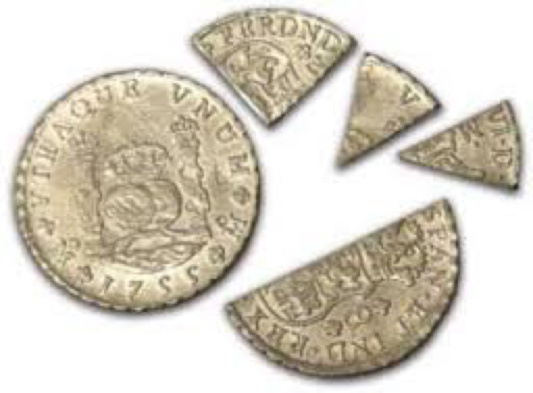 Using the silver value of the coin, people would cut the coin into pieces in order to make subsidiary coinage. A milled dollar cut in half was a half-dollar. That half-dollar cut in half was a quarter-dollar and the quarter-dollar cut in half was called a bit. The bit was the basic unit of commerce since prices were based on the bit. Of course, this was not a perfect solution. It was difficult to cut the quarter-dollars in half with great consistency which created problems when the bit was too small, called a short bit. Sometimes, goods or services would be adjusted to accommodate the short bit. Other times, short bits were supplemented with the English pennies that were allowed to circulate in the colonies. Getting back to our adage, two bits were made from a quarter-dollar. Saying something was not worth two bits was either a negotiating tactic or someone wanted to use a short bit to pay for an item. Like many adages that have origins in the 17th and 18th centuries, the reason for their existence has been lost with time. But arguing about its origin would be rocking the boat. We do know that some of our colonial ancestors should have measured twice and cut once to avoid the problem. But alas, there is no sense crying over spilled milk. Bit coin image courtesy of The Dreamer Comic by Laura Innes.